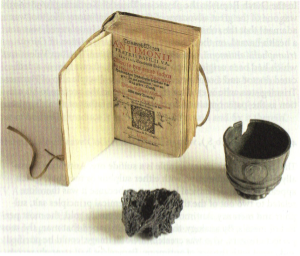 Antimony ore, antimony cup and Basilius Valentinus, Triump-Wagen Antimonii, Leipzig 1604. From: C. van Heertum, Alchemy on the Amstel. On Hermetic Medicine. Amsterdam: In de Pelikaan, 2012. Although it unlikely anyone tried these recipes at home, the use of antimony and its derivatives had a long tradition. Antimony cups were used since antiquity to make antimonial wine by soaking regular wine in it for one or more days. [ii] The fact that antimony frequently occurred together with mercury or sulphur appealed to alchemists, apothecaries, and other medical men and women, as sulphur and mercury were considered the basic alchemical elements. Moreover, as antimony could cleanse the most precious metal, gold, from impurities, alchemists reasoned it could also cleanse and cure God’s most precious creature, created after his own image: man. Hence Paracelsus (1493-1541) and many of his followers advocated the use of small amounts of antimony in iatrochemical drugs, although they were well aware of the fact that it is highly poisonous. French Apothecary Bottle with traces of Kermes Mineral, 1880s. Courtesy of Dr Jack Fincham. [i] De Felice, Fortunato Bartolomeo, Encyclopédie ou Dictionnaire universel raisonné des connoissances, (Paris, 1773), Vol. 25, p. 345. Wilkes, John, Encyclopaedia Londinensis, or, Universal Dictionary of Arts (London: J. Adlard, 1810), Vol. iv, p. 277. [ii] Also see one of my previous blogs on The Medicine Chest. [iii] StClair Thomson, “Antimonyall Cupps: Pocula Emetica or Calices Vomitorii”, Proc. Roy. Soc. Med., Vol. XIX, no. 9, 1925, 123-8. [iv] C. van Heertum, Alchemy on the Amstel. On Hermetic Medicine. Amsterdam: In de Pelikaan, 2012, 49. [v] Lemery, Nicolás, Traité de L’antimoine (Paris: Jean Boudot, 1707). [vi] Gaub, H.D., ‘Chemiae Praxis. Notes of Lectures by an Unnamed Student. Produced in Leyden.’, Closed stores WMS 4 MS.2479, Wellcome Library Manuscripts, p. 593-685. [vii] Willich, A.F.M., A Domestic Encyclopedia Or A Dictionary Of Facts, And Useful Knowledge, 3 vols. (London: B. McMillan, 1802), p. 46.
absolutely fascinating and very well linked to other websites-really appreciate this. Do we know if the “signe of the magpie” was a herbalist shop or something else? Where was Gunpowder alley?